Chinese New Year is just around the corner so I’ve rounded up 35 different recipes to help you celebrate! From appetizers to desserts plus plenty of main dishes and side dishes in between I’ve got a lot of traditional and a few not-so-traditional ideas for you to browse through. I hope you find some new dishes to try! There are so many delicious Chinese New Year appetizers to choose from, you could easily make a meal just from this list alone. From egg drop soup to crispy shrimp toasts there are lots of ways to get your dinner started with some tasty bites. Crispy Salt and Pepper Tofu | This is one of our favorite dishes to order at Chinese restaurants, but it’s also very easy to make at home. The tofu is incredibly crunchy on the outside and soft and silky on the inside. Homemade Dumplings | Once you’ve tried homemade dumplings, you’ll never go back to frozen store-bought ones again. You can make a big batch of these ahead, freeze them, and cook them later. Egg Drop Soup | Out of all the Chinese dishes out there, egg drop soup is probably the easiest one to make. 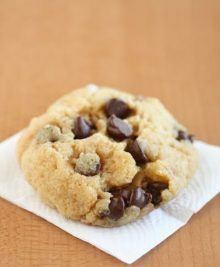 You only need a few simple ingredients and a few minutes to make a batch! 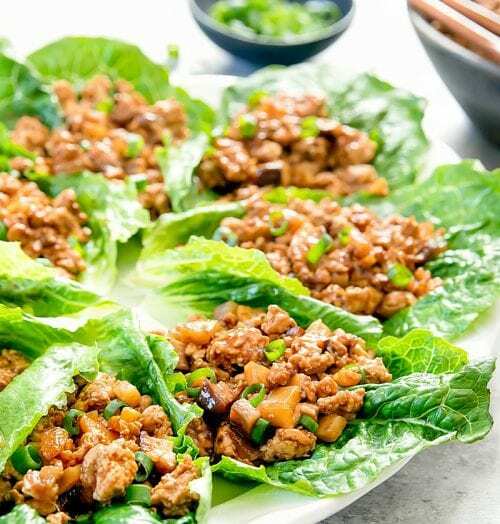 PF Chang’s Chicken Lettuce Wraps | These copy-cat PF Chang’s lettuce wraps are different from the traditional Chinese lettuce wraps I ate growing up, but these days I prefer the copy-cat version. The chicken is coated in a savory sauce made with garlic and ginger and the lettuce wraps don’t take long to make. Chinese Tea Eggs | Chinese tea eggs are hard-boiled eggs steeped in tea leaves, anise and other spices creating a savory flavor and a beautiful marbled look to the eggs. Shrimp Toast | I loved shrimp toasts growing up but only had them in restaurants. They’re actually easy to make so now I make them at home. These toasts have a crunchy exterior and the inside is filled with a soft shrimp mix. 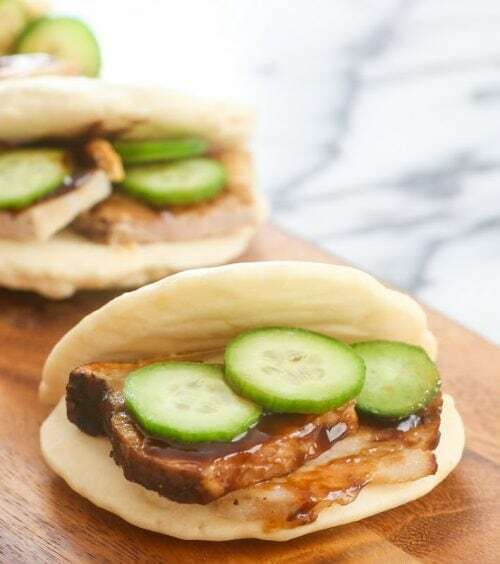 5-Minute Homemade Chinese Buns | These are easy, made-from-scratch Chinese buns, which I stuff with pork belly, scallions, cucumbers and hoisin sauce, inspired by the famous Momofuku’s Pork Belly Buns. Each bun takes less than five minutes to prepare and cook and you don’t have to deal with yeast or steamers. Soy Sauce Eggs | These savory eggs steeped in soy sauce and Chinese spices are great for Chinese New Year or for any potluck or meal gathering. You can slice up the eggs and plate them on a nice platter. Whenever I make them, they are always a big hit! 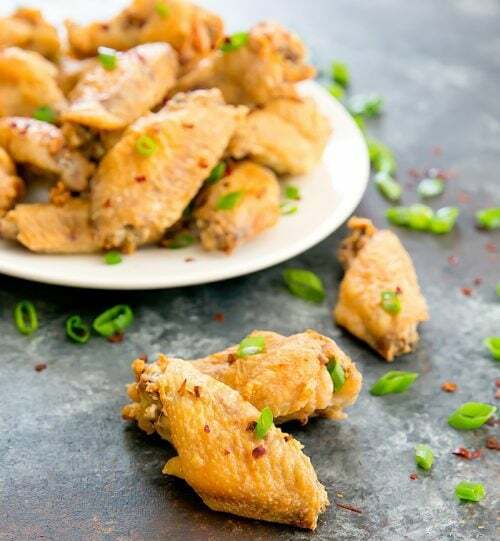 Salt and Pepper Chicken Wings | Chicken wings are fried to a crunchy golden brown and then tossed in a garlic, red chili, white and black pepper mixture, that makes them flavorful and addictive. This version is deep-fried so be sure to check out Baked Salt and Pepper Wings for a non-fried version. Shrimp Chips | Shrimp Chips, also called prawn crackers, are colorful fried chips often served at Chinese and Vietnamese restaurants as decor with dishes like crispy duck. They are actually easy (and fun!) to make at home. Many popular Chinese restaurant dishes can easily be made at home. Whether it’s a classic honey walnut shrimp dish or take-out style orange chicken, it’s fun (and often cheaper!) to make a lot of these dishes at home. These are some of my favorites to celebrate Chinese New Year – I hope you find some new favorites to try! 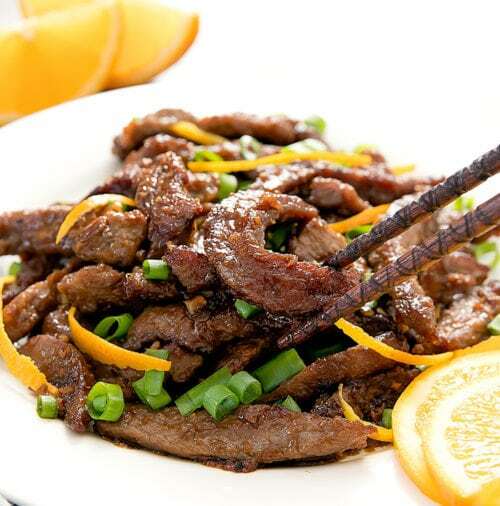 Crispy Orange Beef | This is my homemade version of the popular Chinese restaurant dish. Crispy tender pieces of beef are coated in a savory orange sauce. General Tso’s Chicken | The origins of this famous dish are murky at best but it’s no secret that everyone loves it! My homemade version has crispy fried chicken cubes coated in a salty, slightly sweet and mildly spicy sauce. If you want something a little lighter, I also have a baked general Tso’s chicken recipe that’s great, too! Honey Walnut Shrimp | For some reason restaurants charge a lot for this dish and so I like to make it at home. It doesn’t take long to make and I never get tired of the crunchy walnuts and crispy shrimp in the creamy mayo-based sauce. 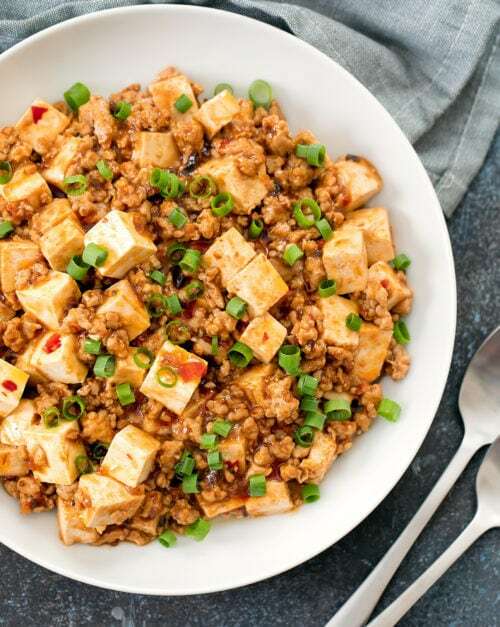 Mapo Tofu | Mapo Tofu is a popular Chinese dish and Sichuan classic. Traditionally the dish is made with ground meat and tender tofu. They are cooked in a variety of chilis for a spicy dish that is usually served with rice, but you can easily customize the dish to suit your tastes. Kung Pao Shrimp | Sometimes homemade kung pao shrimp dishes just aren’t the same as a restaurant version because the shrimp shrink or dry out when you try and make it at home. Well, I learned a simple technique to keep the shrimp plump, juicy and crunchy and I share it with you in this post! Not a fan of shrimp? Give my kung pao chicken recipe a try. Baked Orange Chicken | This is a healthier version of our favorite takeout-style orange chicken and only takes around 30 minutes to make. Instead of frying the chicken, I like to coat it in breadcrumbs before baking it. This gives the chicken a crispy coating without all the oil. I also have a more traditional orange chicken recipe, so be sure to check it out. 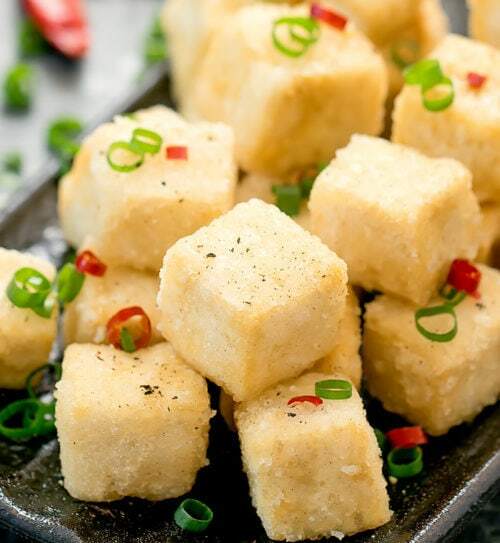 Crispy Baked Garlic Tofu | Tofu is baked until crispy and then tossed in a thick, Chinese-style stir-fry garlic sauce. Crispy Golden Pork Belly | If you’ve ever made pork belly you know it can be quite a challenge to get a golden crispy skin without a lot of tedious prep work. This recipe streamlines a lot of the prep steps and is practically a fool-proof way to get a crispy-skinned pork belly every time you make it! 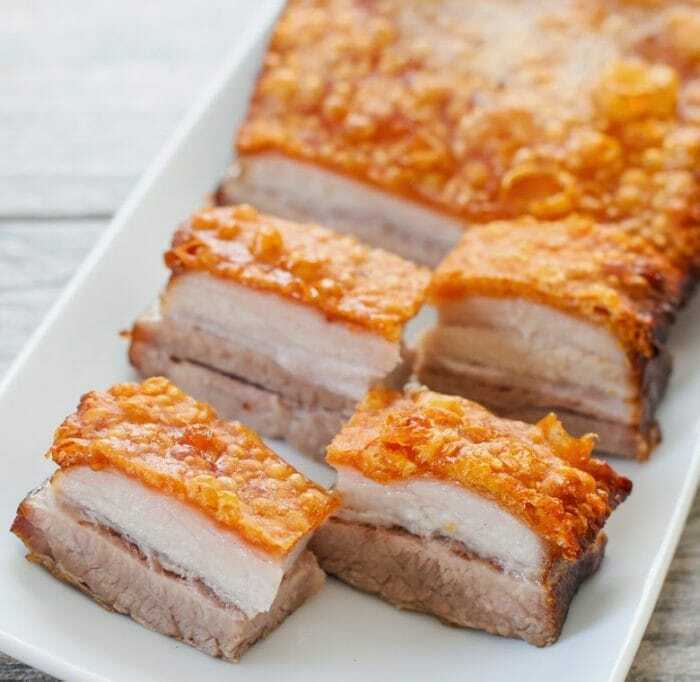 Be sure to also check out my crunchy skin pork belly recipe and my crispy pork belly with sriracha glaze. Baked Honey Garlic Chicken | Crunchy baked chicken pieces are coated in a honey garlic sauce. This is an easy 30-minute recipe. I also have a great honey garlic chicken wing recipe, too! Char Siu (Chinese BBQ Pork) | Char Siu is a sweet and salty pork dish with a sticky sauce that can be served as a main dish or appetizer. It’s very easy to prep, but does need time to marinate before roasting. Whether you love crispy noodles, cold cucumber salad, or a pile of fried rice to go alongside your favorite main dish, I’ve got you covered in the side-dish department for your Chinese New Year celebration! 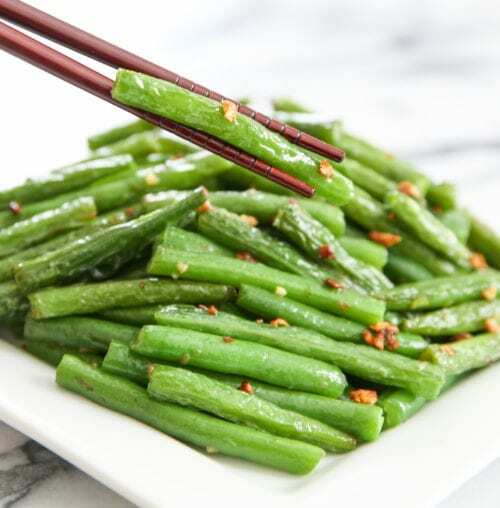 Chinese-Style Garlic Green Beans | These crispy green beans are loaded with garlic flavor. It’s a popular dish at Chinese restaurants, which you can make in your own home. In this post, I share two ways to make this dish – one that is a more traditional deep-fried version and a healthier version that uses less oil. Sheet Pan Fried Rice | When I make fried rice for a crowd the easiest way to get it done is with a sheet pan. It’s easier than doing it on the stovetop (less stirring!) and there’s less clean-up, too. If you want a more authentic version check out my Chinese fried rice post. 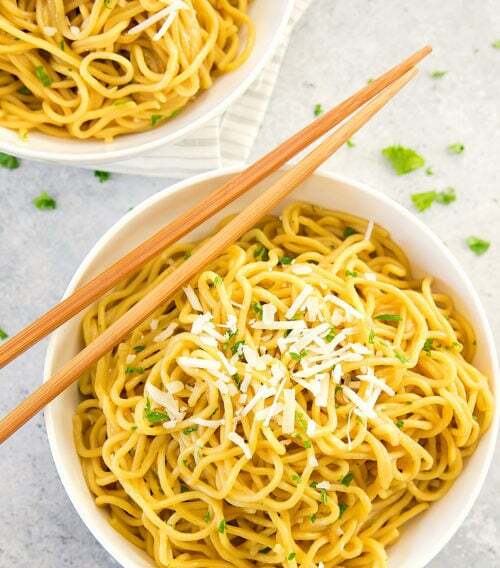 Garlic Noodles | Asian-style garlic butter noodles are easy and delicious. They are ready in less than 30 minutes! Chinese Sesame Bread with Scallions | Chinese Sesame Scallion Bread is a fluffy, thick bread filled with scallions and crusted with sesame seeds. I love ordering it in restaurants and I was so happy when my mom taught me how to make it. Crispy Pan-Fried Noodles | This Chinese dish consists of a bed of crispy noodles, topped with stir-fried vegetables, shrimp, chicken, and flavored with a thick gravy-like sauce. 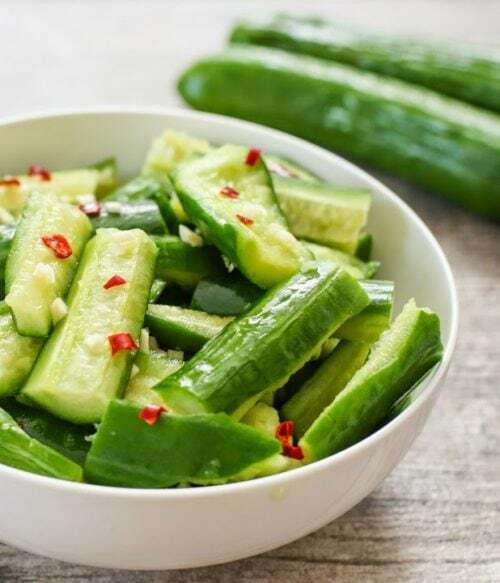 Smashed Cucumber Salad | Smashed Cucumber Salad is a simple, flavorful, cold marinated Chinese-style cucumber salad that uses a knife smashing technique to cut the cucumbers. The refreshing dish comes together in about 5 minutes and is extremely addictive. I love this salad so much I have a couple variations so be sure to check out my spicy Chinese cucumber salad and sriracha Chinese cucumber salad if you want to add some heat! Homemade Steamed Buns (Mantou) | Steamed buns, or mantou, are a staple in Chinese diets. I grew up eating these buns and so it was really fun to learn how to make them from scratch instead of buying frozen ones at the store. Garlic Broccoli Stir-Fry | Learn how to make Chinese restaurant-style garlic broccoli stir-fry at home. The broccoli comes out very crisp and is coated in an easy garlic sauce. This is my favorite way to eat broccoli! 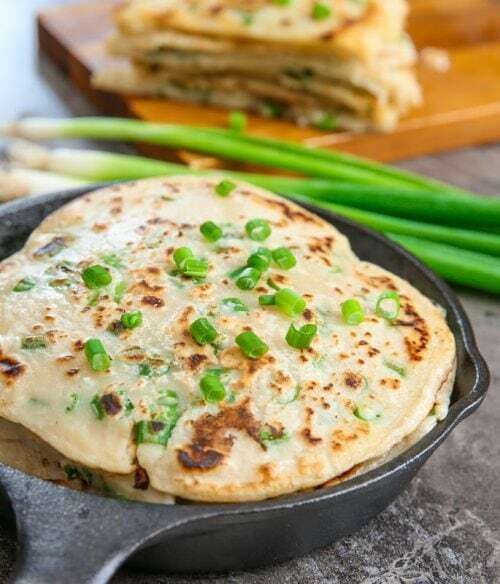 Short-Cut Chinese Scallion Pancakes | These shortcut Chinese scallion pancakes taste similar to the traditional version, but without having to deal with kneading or rolling dough. The batter comes together in about 5 minutes. Or, if you’re feeling ambitious and want to make a traditional dough, give my green onion pancakes a try! Every celebration needs a little something sweet to finish things off. Here a few of my favorite traditional Chinese New Year dessert recipes plus a few not-so-traditional ones, too. 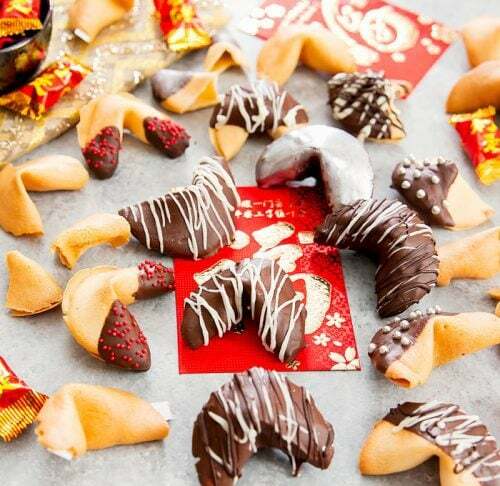 Homemade Fortune Cookies | These fortune cookies are easy to make with just four ingredients and you only need a few minutes of prep time. You can customize them with your own messages and dip them in chocolate for gifts or favors at a party. 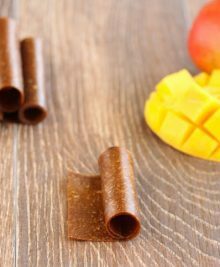 Chinese Pineapple Cakes | These square-shaped cakes have a buttery, shortbread-like casing with a pineapple filling similar to a very thick jam. They take time to make but I find it’s worth it because I’ve never found a store-bought pineapple cake in the US that I like. Matcha Green Tea Molten Lava Cakes | These aren’t exactly a traditional Chinese New Year dessert, but the combination of matcha green tea with a lava cake is one that’s hard to resist! Mochi Ice Cream | Mochi is a Japanese treat, but I love it so much I had to include it in this round-up because it’s one of my favorite treats. 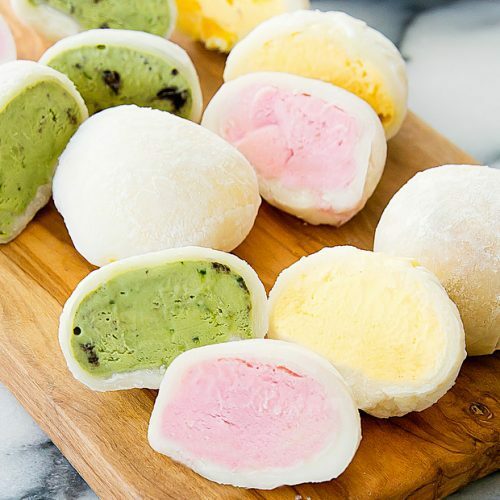 You can make your own mochi ice cream at home, plus it’s easy to make ahead and keep in the freezer until you’re ready to serve. Mini Mochi Donuts | These little mini mochi cakes are shaped like donuts and topped with a chocolate glaze. They’re a cute dessert for a party! Chinese New Year Cake | One of the traditional dishes eaten during the New Year for Chinese people is a New Year Cake. It’s a very simple steamed cake, made with glutinous rice flour for a mochi-like chewy texture and sweetened with brown sugar.